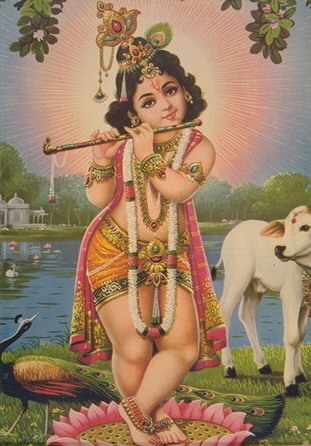 One saintly brahmana who was most virtuous was touring the places of pilgrimage in order to obtain Sri Krishna. He used to worship Gopala by chanting the six-syllable Gopala mantra, and without having offered bhoga to Gopala he would eat nothing. Hanging from his neck like a brilliant jewel was his Bala Gopala Salagrama. By his transcendental good fortune, one day he came to the home of Jagannatha Misra in Navadvipa. The pious pilgrim’s brahma-tejas was incomparable; from his mouth, the sound “Krsna, Krsna” was always emanating, and within his heart he was always relishing the transcendental mellows of affection for Govinda, such that his eyes were always filled with tears. The brahmana said, “Misraji, whatever you desire.” Sri Misraji in great ecstasy collected the best of all materials and cleaned the kitchen thoroughly and presented everything to the brahmana. He also supplied the best of all foodstuffs from his pantry. The brahmana, becoming very happy, cooked everthing and sat with eyes closed in meditation to offer the bhoga to Sri Gopala Krsna (his Salagram shila). The brahmana replied, “All right. If that is your desire I will cook again.” Hearing this, everyone was happy, and somehow or other collected everything from other places, cleaned everything, and arranged for the brahmana to again cook. Everyone said to one another, “This child is too restless. See that he is restrained and cannot return again to cause more disturbances.” For as long as the brahmana was cooking, the Lord was taken to another house and kept there. Then Sacimata, holding young Nimai in her arms, took him away to another house. There, all the ladies said, “Why Nimai? Why did you eat the brahmana’s offering?” The Lord smiled. His smile was as beautiful as the moon. He then said, “What fault of mine is there in this? The brahmana himself called me to eat!” They all said, “You rascal Nimai! You ate his cooking, but do you know what his caste is? Or where he’s come from? What will you do now? How will you maintain your caste?” Nimai smiled and said, “I am just a cowherd, but I eat the food of brahmanas all the time. Can a cowherd’s caste be spoiled by eating the cooking of brahmana?” They all looked at Nimai’s mouth and they all looked at Nimai’s mouth and began to laugh. Sri Gaura was explaining his factual identity, but they were unable to understand a single thing of it. Hearing the Lord’s words, they simply laughed and squeezed Nimai to their breasts; they were unfazed. The brahmana again finished cooking and offered the bhoga to Gopala with his eyes closed, seated in meditation. He began to meditate upon Bala Gopala in his heart. This fact was taken note of by Sri Gauracandra. He is the Lord within the heart. Bewildering everyone, and laughing to Himself, He somehow escaped that house and arrived once more to where the brahmana was meditating. Quietly, He sneaked a fistful of rice and put it into His mouth. The sounds of His munching broke the brahmana’s meditation–he saw Nimai. The brahmana again cried, “Hay! Hay!” and Sri Gaura Prabhu swallowd the rice and ran off. Misraji saw this and quickly took one big stick in a rage, and ran off to catch Nimai. Sri Gauranga became most fearful and ran from one house to another, and Misraji quickly followed Him, burning with anger. Sri Misra said, ” If I catch you for what you’ve done today, I will beat you with this stick. I’ve lost all my patience and discrimination.” “Where is that great thief of a son of mine? 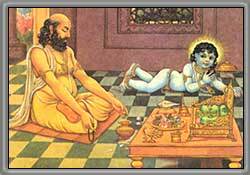 Which house is He hiding in?” Saying this, Jagannatha Misra pursued his son Nimai. Everyone began to say, “Misraji, you’re very great and magnanimous. You ought to forgive such a minor offense. These children, they have no sense. How can you beat a mere child like this? In this way, they began to give him instruction, but to no avail. Somehow or other, the pious brahmana appeared on the scene and, clutching Jagannatha Misra’s hand said, “Misra Rai, look, there’s no fault in this boy. What’s meant to happen is meant to happen. It just must be my fate that today Krsna will not accept my bhoga offering. That’s my problem. Please don’t be so dejected. This I’m telling you.” Jagannatha Misra simply stood there completely angry and completely miserable. At this point, Bhagavan Visvarupa arrived there. There was incomparable beauty in all of His limbs and He had great transcendental effulegence, and charming countenance, with a yajna-sutra hanging from His shoulder, He was the personification of brahma-tejas. He was non-different from Nityananda Prabhu. All the sastric conclusions were always ready upon His tongue, and He was always explaining pure devotional service to Lord Krsna. Seeing such an unprecedented personality, the pious brahmana was struck with wonder and began to look at Him. His eyes filled with tears. He asked, “Noble Sir, whose son are You?” Everyone answered, “He is the elder son of Jagannatha Misra.” Hearing this, the brahmana became very happy and embraced Visvarupa. “Your mother and father are most fortunate to have such an unequalled son as you.” Sri Visvarupa offered His pranamas to the brahmana and the two sat down. As if exuding a stream of nectar from His transcendental mouth, He said, “What a fortunate, greatly auspicious day has come upon us. My house is blessed with such a saintly personality as Your Grace. Great personalities such as you wander from one place to another to bless the denizens of this planet with your purifying association. You are always full in ecstasy and, freed from any material desire, simply wander at will filled with bliss. We are most fortunate that you have arrived as an unexpected guest in our house today. What can I say of our misfortune that you are fasting? The house from which a guest leaves without having eaten will only see misfortune henceforth. Having your darshana, I am most fortunate but hearing what everyone (about your fasting) has said, I have become most unhappy. The brahmana said, don’t be unhappy about anything. If there are any roots or berries available, I am content to eat that only. I am a forest-dweller, and I am well-accustomed to eating such things. Some days, nice grains are cooked, and sometimes there is some obstacle which makes this impossible. Just seeing you people has given me greater joy millions and millions of nicely prepared offerings. Sri Visvarupa continued, “Priyavara, please don’t take offense, please cook something at least, just once more, and everyone will become happy. Bowing down, He clutched the feet of that brahmana in his hand with this entreaty. The brahmana looked at Visvambhara and said, “Alright, I will cook.” Hearing this, everyone became joyful again, singing out, “Hari bol, Hari bol!” They all cleaned the kitchen again and in but a minute, everything was assembled and ready. The brahmana then entered the kitchen. Sri Gaura-gopala took note of this. Everyone told Jagannatha Misra, “Misra, lock your door from outside so that Nimai won’t be able to get out.” Misra said, “Good, I’ve already locked Him up inside, too. Meanwhile everyone on the outside locked the door to Jagannatha Misra’s house from the outside. The ladies all said, “Don’t worry, Nimai has gone to sleep now–He won’t be going out to eat anything tonight!” The brahmana soon finished his cooking. That fortunate brahmana then began to offer his bhoga to Lord Bala Gopala. The indwelling Supersoul Sri Gaurasundara then thought, “The bhoga is ready now.” Once again, the desire to give His darshana to that brahmana arose within His heart. Thus the Lord left the house while everyone was sleeping (by this time, it was late at night). Nobody knew about this. Nimai appeared at the place where the brahmana was meditating. Seeing the child again, the brahmana again cried, “Hay! Hay!” In utter frustration, he began to cry. But this time nobody heard him — they were all fast asleep. Then Sri Mahaprabhu said, “Oh, brahmana, you are very exalted. What is My fault if I come as soon as you call Me? You’re chanting My mantra, invoking My name, how can I not come? Every time you’re making your offering with such pure devotion, so every time I come to give you My darshana. At that very moment, the brahmana had the darshans of Lord Gaura in a wonderful form. Before him, Lord Caitanya manifested His eight-armed Bala Gopala form. In four hands were the conch, disc, club, and lotus; with two hands, He was playing the flute; in one hand He was holding a ball of butter; and with the other hand He was eating butter. Upon His breast were the srivatsa and the kaustubha jewel, and brilliant garlands of jewels hung from His neck. All of His limbs were bedecked with beautiful ornaments and jewels, and upon His head was an ornament of gunja beads and a peacock feather. The lips of His moon-like mouth were enchanting, and He looked about here and there as He smiled. He had a vaijayanti mala, and there were shark-shaped earrings swinging from His ears. There were jewelled ankle bracelets upon His feet, and His toenails were resplendent. The brahmana then saw that the Lord was beneath a kadamba tree and He saw Vrindaban, there were birds flying in all directions. On all sides of the Lord, there were cows, gopas, and gopis. Whatever the brahmana was accustomed to meditating upon within his heart, that beautiful vision was now manifest directly before his eyes. That fortunate brahmana saw such wonderful opulence that he simply fainted in bliss. The ocean of mercy, Sri Gaurasundara held him in His own transcendental hands. From His touch, the brahmana regained consciousness, but he was struck dumb with transcendental bliss and he could not even utter a word. Again and again, he fainted to the ground, and again and again he would rise in great ecstasy. There was perspiration, trembling, horipilation, and all manifestation of ecstatic symptoms in his body. A vast river of tears flowed from his eyes. For a moment the brahmana regained his sense and fell at the feet of Sri Gauranga and began to cry loudly. Seeing the condition of this brahmana, Lord Gauranga began to laugh. Sri Gaura Prabhu said, “He, Priyavara, listen. You are My servant for many births. You are always desiring my darsana, and in this way I am always giving you My darshana. In a previous birth, I gave you My darshana in just this way in the house of Nanda Maharaja. You don’t remember this. When I appeared in the home of Nanda Maharaja in Gokula, in that birth, you too appeared as a brahmana wandering from one holy place to another. By transcendental fate, you came to the home of Nanda Maharaja and offered bhoga in just this way. At that time, I tricked you and ate your offerings, giving you My darshana just as I have today. You are My servant birth after birth. How could you get the darshana of such a wonderful form if it were not so? The Lord then said, “Hey vipra! This is a very confidential matter. You should not disclose this to anyone. If you mention this to anyone, I will annihilate you! Listen, I have now appeared in this world for the purpose of spreading Krsna Sankirtana, and I will do this. I will go house to house giving out such devotional service as either Lord Brahma or Siva cannot desire. Repeated sounds of his calling and crying woke the others in the house. They shook off sleep, said achamana, and came to see the brahmana. Seeing him, everyone became very happy. The brahmana in his mind again and again began to think, “If I could only tell these people that Parameswara is living in their home, they could become liberated from material existence and go back to Godhead.” Then he thought, “Oh, even Brahma and Siva cannot have such good fortune to have the Supreme Lord living with them. They all simply think that He is an ordinary child. If I could inform them of the real situation, they could obtain the Supreme destination. But then he remembered that the Lord told him not to reveal this to anyone. And he became afraid, the Lord’s request should not be broken. In this way the brahmana said nothing to anyone. Having recognized Bhagavan, that brahmana then stayed only in Navadvipa and resided there concealing his feelings. That brahmana would go here and there to beg and every day would come with the hope of seeing Lord Gaura Bhagavan.